India has fallen from among the best-performing in emerging markets last year to the only one in the BRICS (Brazil, Russia, India, China and South Africa) pack which has given negative returns for the year. A combination of prices of commodities such as oil, adverse currency movements and unfavourable local factors have made India less of an investor favourite in 2015 than last year. Commodity-heavy countries, on the other hand, have significantly outperformed, both as compared to India and their own performance last year. Brazil is up 13.6 per cent, Russia is up 21.4 per cent and South Africa by 9.2 per cent. The first two had negative returns in 2014 and South Africa a gain of six per cent. The biggest gainer is China, up 35.3 per cent. India, in comparison, is down 0.9 per cent, after a year in which India gave 30 per cent return, with many individual stocks up multiple times. Tirthankar Patnaik, chief strategist and head of research, Mizuho Bank, said India's relatively poorer show was likely to persist. 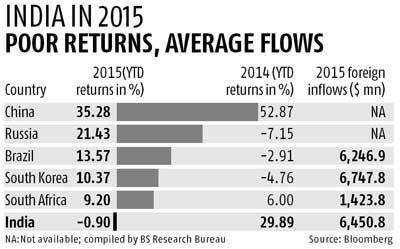 “China has been doing well, so one would see some relative underperformance in India. Also, earnings have been lacklustre for three quarters." Compared with other markets, there is a sense that it is time to take some money off the table at such high valuations. It will take another five to seven per cent fall before people find there is value in buying into Indian companies. People are selling on every bounce. I don't see any positive triggers emerging until the results season is over in early June,” he said. An Edelweiss Securities report, titled ‘Strategy — Nifty‘s correction: Look West, not East’, pointed the finger to commodity price movements, led by a strengthening dollar. “The epicentre of dislocation in global markets is the reversal of dollar strength since March. It triggered a re-allocation in global asset markets. The associated commodity spike, in turn, is causing a rotation within the asset class. India was caught on the wrong side of this trend reversal,” said the report, authored by analysts Nirav Sheth and Kapil Gupta, issued this month. Edelweiss believes the current dollar strengthening trend has pretty much played out and commodity prices should start correcting. This would help India over a longer time frame, it said. Other emerging markets were hit by the commodity fall last year and are now seeing a comeback, following the improvement in commodity prices. But, the recent uptrend should not be extrapolated to a larger move away from India and towards commodity-led countries just yet, agreed Pankaj Pandey, head of research, ICICI Direct. “It is too early to say the commodity trend has reversed, as long as there are signs of a slowdown in the Chinese economy…It wouldn’t be fair at all to say that foreign investors would prefer other emerging markets over India. They had all been slightly overweight on India, and what we have seen is a bit of a tempering of that position,” he said. Some experts have suggested China might draw liquidity away from India. Gopal Agrawal, chief investment officer, MiraeAsset Global Investments (India), said the recent upside in China was helped by lower interest rates and better earnings from sectors such as insurance, which have a large index weightage. Also, other asset classes in China have disappointed lately, which has resulted in domestic capital being allocated towards equities. 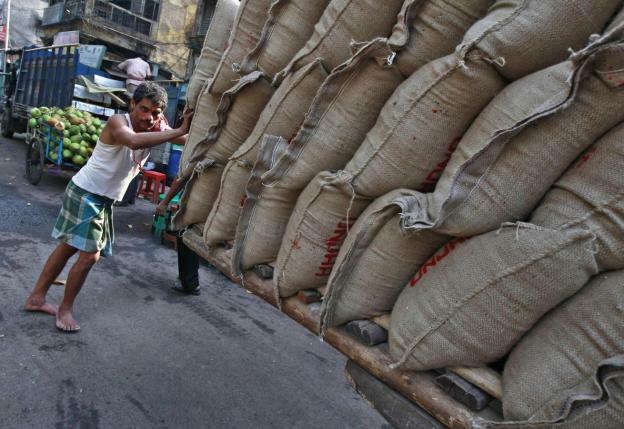 Image: A labourer pushes a hand cart loaded with sacks of rice at a wholesale market in Kolkata.